Skip the tourist trap and get the best of mountain life right here in the middle of it all. 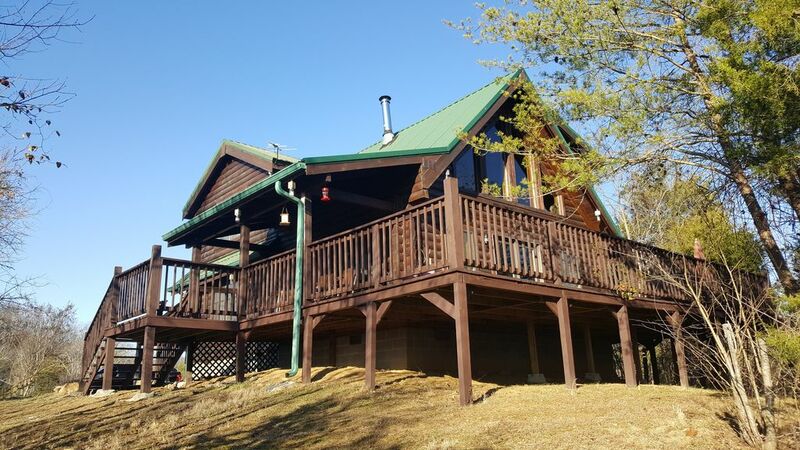 You will be king of the hill in our beautiful log home that is situated on top of a private 6 acre knob with mountain views. We are located approximately 15 minutes to the Hiwassee River/Cherokee National Forest & 25 minutes from Tellico Plains, Cherohala Skyway, Ocoee River. Our cozy log home has 4 bedrooms and 2 bathrooms with 1600sqft to sprawl out in. Wrap around deck sits within the tree tops with great mountain view. Paved, private entrance that leads up to our home with double carport to keep your toys dry. In addition, there is a large wrap around deck with plenty of seating and charcoal grill to do some outdoor cooking. There is also a fire pit in the back for making s'mores. You will be able to use the entire cabin, you are renting the entire place and not sharing with anyone. You will have access to a fully operational cabin and only need to bring your suitcase and toothbrush. Everything was excellent. Big comfortable cabin, new appliances, quiet peaceful area. Grocery stores and gas station nearby. Only two observations which are not deal breakers, Need Wifi ! !, specially since several of the DVD movies were scratched. Overall, it was a nice experience and I wish we had stayed longer , thank you Wayne ! what's not to like about a grand daughter visit. I love the cabin. I only wish it had cable and wifi. We had an amazing time in this beautiful cabin hidden away with a glorious view! They have pretty much everything you need to enjoy a special time away. The only two things that keeps me from giving a five star stay way the gate fence lock was not functional it took me about 30 min to unlock it the cleaning crew told me I was goin to have trouble with it sure did I had trouble opening it. It needs replacing ASAP. 2nd the beds were not comfortable at all basted bedroom mattress sinks to the middle so u and your partner will sag to the middle all night long. Aside from that we had a very memorable experience hope they fix this issues and the house will rate a 10 star. Peaceful area. Minutes to town. Clean cabin with all you could need. Will rent again. The cabin and property were beautiful and comfortable. We enjoyed our stay even though it rained for 3 days! This is a very nice place. We plan to come back..